Cinnamon is a dried bark of cinnamon, which you will usually buy in the form of a fine powder or as a cork wrapped up in a cane entirely. Do you know what health properties do cinnamon have? Studies show that regular consumption of cinnamon improves the learning process. Thanks to this spice you can quickly remember new information and combine facts. 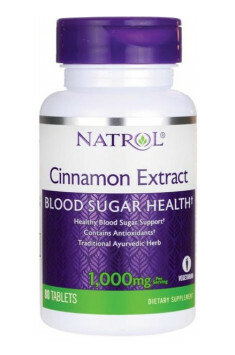 Cinnamon positively affects the cholesterol level in the blood leading to its lowering. Daily seasoning also stabilizes blood sugar levels. People with genetic type II diabetes should reach for cinnamon more often. Cinnamon has a soothing effect on inflammation in the body. It is worth introducing cinnamon into the diet in autumn and winter to strengthen immunity and counteract colds. Cinnamon is a powerful antioxidant. ORAC coefficient for cinnamon, which illustrates the ability to neutralize free radicals is up to 131,000 and is one of the highest among all foods. It is thanks to these properties that cinnamon can prevent cancer. Cinnamon oil responsible for the characteristic smell of cinnamon has an antibacterial effect. Its addition to a meal can help you avoid or alleviate the course of food poisoning. Cinnamon oil deters ticks and mosquitoes! Large amounts of cinnamon can irritate the delicate mucosa of the digestive tract. It should be avoided by people suffering from stomach inflammation, heartburn or irritable bowel syndrome. Cinnamon is a source of coumarin, a compound that, when consumed in excess, can lead to liver damage. However, you would have to add a large amount of cinnamon to each meal, so that the condiment could cause harmful changes. Daily intake in moderate amounts is completely harmless and brings many benefits. Previous Post 15 products that are always worth having in the kitchen if you want to eat healthy! Next Post Why is it worth eating bananas?